Part of being a Program Manager is dealing with ambiguity. But like all people, I sometimes have problems with this myself. Especially with my current job. I am the trailblazer at my work when it comes to Program Management. It never really had a program management office which means I need to start it from nothing. In the past few weeks, I have found myself in a situation where I didn't know what to do next. For someone like me who is action oriented, this can be very frustrating. There seems to be so much to do, I don't really know where to start. Ambiguity? 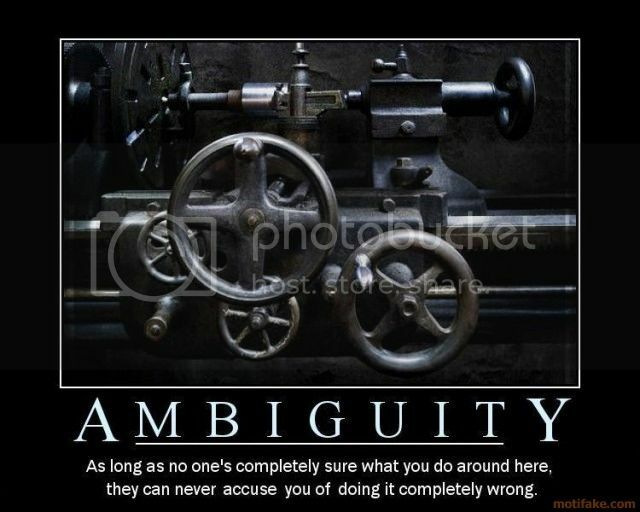 I eat ambiguity for breakfast!!! We all have to deal with changing circumstances on a daily basis, whether we realize it or not. Traffic, inflation, the job market...we don't really know what will happen, so we deal with it. Decision paralysis is dangerous...DS won't do anything if faced with too many decisions (M&Ms, Snickers, Twizzlers, or Milky Way...I dunno, Mom, you pick for me! ), and most of us adults are the same way! Yeah. some people handle it much better than others. I normally do, but for whatever reason, probably the very high level of ambiguity I'm dealing with, I have been struggling. I have same situation. Got promoted around 2 weeks ago. Have no instructions, have no documentations. I replace a manager who is on long leave for maybe 6 month. I don't even know which file(s) she was working on. I am going crazy. What to do? I understand that I have to ''challenge status quo''. But no one is there to show me, to explain me. Everyone is busy and looks like with every question I just bother them. This is a pretty common occurrence. I find the easiest way to handle these type of situations is to don't ask, just do. I know it can drive you crazy not having instructions, but the flipside is if nobody can tell you what to do, nobody can tell you what you are doing is wrong. I have same situation. Got promoted around 2 weeks ago. Have no instructions, have no documentations. I replace a manager who is on long leave for maybe 6 month. I don’t even know which file(s) she was working on. I am going crazy. "if nobody can tell you what to do, nobody can tell you what you are doing is wrong"
No one may be able to tell you what to do but you will have no shortage of people to tell you or at least think that what you are doing is wrong. IMHO it is precisely for that reason that ambiguity drives us crazy.